Our partner organization Hooked On Drums™ brings the upbeat, inspiring rhythms of West African djembe drumming to kids in urban Chicago. Hooked On Drums offers artistic residencies, ongoing classes, workshops and performances at schools, parks, neighborhood groups and community organizations. 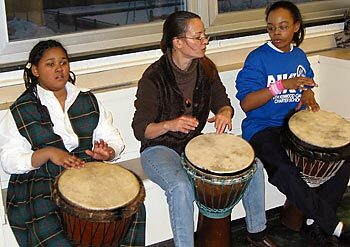 More than just a way to “blow off steam” or “keep kids off the street,” Hooked On Drums gets kids hooked on authentic, traditional music, allowing them to explore African heritage while sharpening their minds on a complex musical idiom. And the rhythms are irresistible! 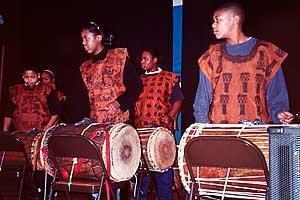 Hooked On Drums is deeply committed to teaching African music as a vehicle for fostering creativity, curiosity, discipline, self-confidence and well-being in youth—above all, inner-city, at risk youth. Click here to sign your child up for our newest open classes! See Videos of Hooked On Drums Youth Performances and Recitals! Soldier Field Chicago Park District youth awards banquet in April 2004.
for the 2003-4 school year. 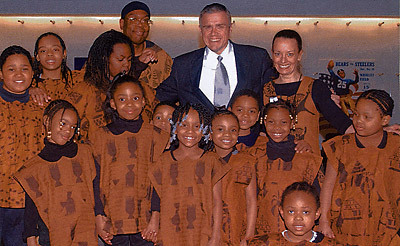 at the program's finale performance, February 2002. Contact us about bringing a youth program to your school or organization. Visit the Hooked On Drums Website, www.hookedondrums.org, for more information, videos and photos. after school program in Chicago, 2003-4 school year.